of the Philips things! The first video I watched was caddy shack. a video. We used to go round and watch stuff played fast, slow or backwards. Last edited by grhaffdd; 24-05-2011 at 03:31. My parents waited until late 1987 to get one, after prices came down & VHS won the format war. It was an Amstrad 4600, which lasted until 2004. Early '80s top loading VHS panasonic (with free blank tape) on rental. Firt legal video? An American Werefolf In London then a pirate of mad max 2. First Video the family hired was a Sharp VC381H in 1983. The first thing I recorded was 'The Final Countdown' starring Kirk Douglas. The tape lasted until I finally disposed of my VHS collection two years ago. I then purchased a Ferguson Videostar 3V48 in 1986 which provided sterling service until about 2006 when the drivebelts finally gave up. 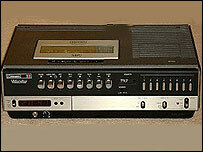 I finally purchased a JVC HRD960EK Editing deck in 1992. I still have it but it was nowhere near as reliable, having been repaired twice. My uncle bought us a Hitachi top-loader second-hand around 1986. He couldn't get it to tune in to out ancient TV set but somehow I got the hang of it. The first thing I taped was Cyndi Lauper singing "Change of Heart" on a battle-ship surrounded by young sailors! Then just by chance Kate Bush came on with her fantastic video "Experiment IV". I've still got that tape....and all my other VHS tapes from the 80's.....the playback quality is still excellent after two and a half decades! I was late in getting one,not sure of the year,late '80's anyway.We got a top loading Betamax,cos my dad's cousin had one,we used to borrow all his copied videos. Only just come across this thread. Yes, it was this one for us too, and the first thing I recorded was Doctor Who - The Leisure Hive. This is what we had.Think the first thing I watched was ET!